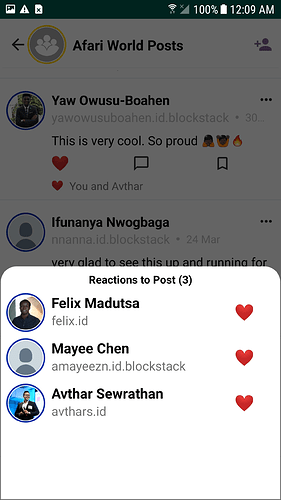 The Afari team (myself, Richard Adjei and @avthars) has been working tirelessly over the last few months to build a fast and fun way to communicate and socialize with all the groups in your life, like friends, family, colleagues, or interest groups. Colors allow you to prioritize groups and people you want to receive content from using blue (lowest priority), bronze, silver or gold (highest priority). For example, in a big group about crypto, you can color the high signal people gold, so you see their posts or messages first. The Very Important Feed (Digest) give you a quick summary of content from groups you care about, ordered by their importance to you. Gold groups and connections come first, then silver, then bronze. No more missing important messages or wading through group chats to find out what’s happened. The color of groups and people is indicated using a circle around their image. For large groups or groups that want structured discussion, it is useful to use a Twitter-style feed interface with threads. For smaller groups or groups that want a more flowing conversation, a messaging-style interface works better. Afari helps you to have both by letting you choose you to choose which of interface type is best for you and your group’s use case. Pinned posts or messages allow group admins to make sure that very important announcements or reminders are seen by everyone in the group, as soon as they enter the group. This saves them time and also stops important content being buried under irrelevant content. These can also be used as informal polls for people to show how they feel about options. No more worrying about your reply being received without enough context. See who’s seen and reacted to your posts and messages. We’d love to hear your feedback either in the Support/ Help group in the app or via email (hello@afari.io). You can also find us in the Blockstack Slack.